U.S. stocks rebounded on Friday, recovering most of Thursday’s near 1% decline. The reason? Beleaguered Deutsche Bank AG is reportedly poised to settle the U.S. Department of Justice claim for $5.4B, less than half of their original amount request. The DOJ said they were open to negotiations to settle its $14B claim for errant practices in selling residential mortgage-backed securities (MBS). Financials led Friday’s rebound, while Energy gained the most last week after OPEC surprised Wall Street with a framework agreement to cut oil production in November. Friday’s recovery helped extend the modest equity rally into a third week and cap the S&P 500 with its fourth quarterly gain. The S&P 500 gained 3.85% in the third quarter, its strongest quarterly performance of the year. For the week, the S&P 500 gained +0.20%, the Dow Industrials added over 46-points (+0.26%), and the MSCI EAFE (developed international) fell -0.68%. The third-quarter (3Q) corporate earnings reporting season is now underway. 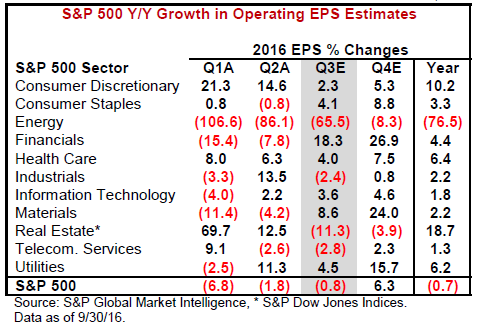 As of September 30, 2016, S&P Global Market Intelligence’s aggregate 3Q 2016 S&P 500 operating earnings per share (EPS) estimate is $29.40, down 0.8% on a year-over-year basis (versus the $29.64 in 3Q 2015). While this is projected to be the lowest quarterly earnings decline this year (and positive next quarter), this decline represents the first time since 2009 that the S&P 500 posted year-on-year EPS declines in five successive quarters. Surprisingly, as the above chart shows, a full seven of 11 S&P 500 sectors are expected to post positive earnings growth for the third quarter, with Consumer Staples, Financials, Materials, and Utilities leading the way. Among laggards (red numbers in parenthesis), the energy sector continues to weigh heavily on the Index. The other sectors projected to show declines are Industrials, Real Estate, and Telecommunications. Excluding the energy drag, S&P 500 EPS would be up 2.5% in the quarter.